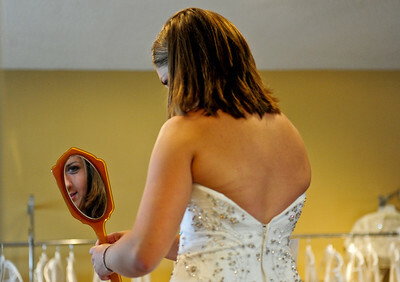 Josh Peckler - Jpeckler@shawmedia.com Lindsey Krygsheld of Crete looks at herself in a mirror while trying on wedding dresses at Kathryn's Bridal in McHenry Wednesday, July 11, 2012. Krygsheld was trying on dresses as part of the Brides Across America program that gives brides of military members free wedding dresses. Krygsheld's future husband is currently serving in Alaska with the Army. Josh Peckler - Jpeckler@shawmedia.com Darcy Krygsheld of Crete (center) reacts with Julie Smit of Munster, Ind. (left) to seeing her daughter Lindsey Krygsheld in a wedding dress for the first time at Kathryn's Bridal in McHenry Wednesday, July 11, 2012. Krygsheld was trying on dresses as part of the Brides Across America program that gives brides of military members free wedding dresses. Krygsheld's future husband is currently serving in Alaska with the Army. For more photos please go to NWHERALD.COM for a photo gallery. 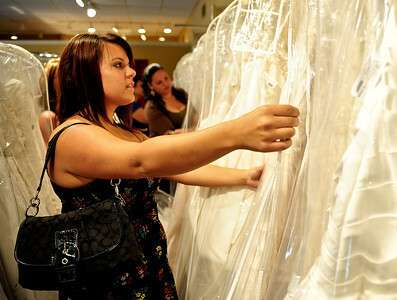 Josh Peckler - Jpeckler@shawmedia.com Malissa Pagan of Chicago looks at wedding dresses at Kathryn's Bridal in McHenry Wednesday, July 11, 2012. Pagan was trying on dresses as part of the Brides Across America program that gives brides of military members free wedding dresses. 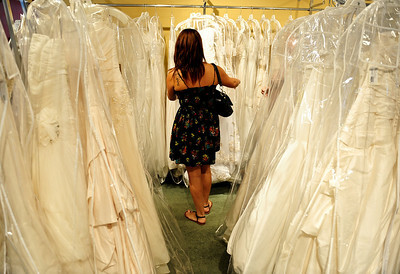 Josh Peckler - Jpeckler@shawmedia.com Malissa Pagan of Chicago (left) looks at herself in a mirror while her mother Maria (center) and sister Melanie look on at Kathryn's Bridal in McHenry Wednesday, July 11, 2012. Pagan was trying on dresses as part of the Brides Across America program that gives brides of military members free wedding dresses. Josh Peckler - Jpeckler@shawmedia.com Malissa Pagan of Chicago wipes away tears while trying on wedding dresses at Kathryn's Bridal in McHenry Wednesday, July 11, 2012. Pagan was trying on dresses as part of the Brides Across America program that gives brides of military members free wedding dresses. Josh Peckler - Jpeckler@shawmedia.com Malissa Pagan of Chicago (right) is helped by her mother Maria as they bring out a wedding that was given to Malissa at Kathryn's Bridal in McHenry Wednesday, July 11, 2012. Pagan was trying on dresses as part of the Brides Across America program that gives brides of military members free wedding dresses. Josh Peckler - Jpeckler@shawmedia.com Melissa King (left) places a vale on the head of Malissa Pagan of Chicago (right) at Kathryn's Bridal in McHenry Wednesday, July 11, 2012. Pagan was trying on dresses as part of the Brides Across America program that gives brides of military members free wedding dresses. Josh Peckler - Jpeckler@shawmedia.com Malissa Pagan of Chicago (left) looks at herself in a mirror while her sister Melanie takes a picture with her cell phone at Kathryn's Bridal in McHenry Wednesday, July 11, 2012. Pagan was trying on dresses as part of the Brides Across America program that gives brides of military members free wedding dresses. Josh Peckler - Jpeckler@shawmedia.com Lindsey Krygsheld of Crete is helped by her mother Darcy while trying on wedding dresses at Kathryn's Bridal in McHenry Wednesday, July 11, 2012. Krygsheld was trying on dresses as part of the Brides Across America program that gives brides of military members free wedding dresses. Krygsheld's future husband is currently serving in Alaska with the Army. 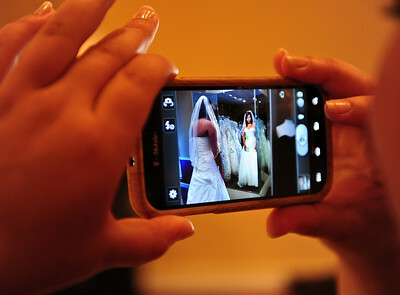 Malissa Pagan of Chicago (left) looks at herself in a mirror while her sister Melanie takes a picture with her cell phone at Kathryn's Bridal in McHenry Wednesday, July 11, 2012. Pagan was trying on dresses as part of the Brides Across America program that gives brides of military members free wedding dresses.